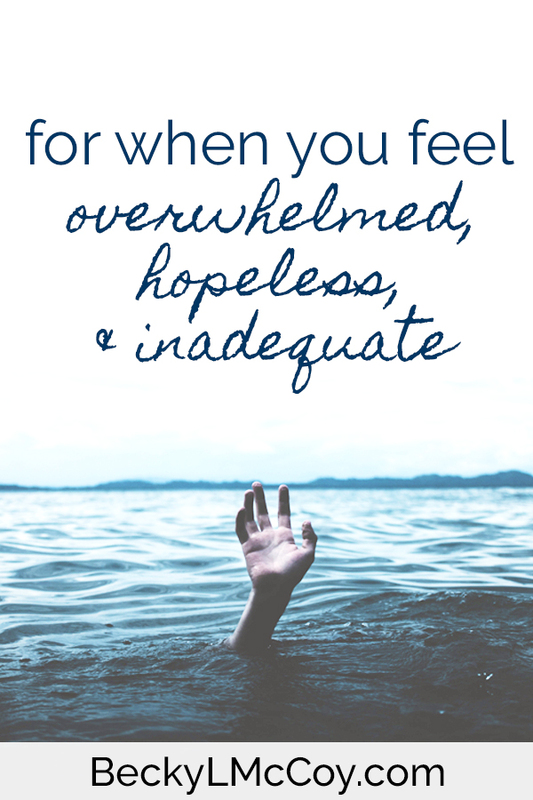 Sometimes I feel overwhelmed, hopeless, and inadequate. On Thursday, we were late in bringing Caleb to school. We had spent the morning in a three-year-old vs. mom battle of the ages where he wouldn’t eat breakfast or get dressed. None of my usual convincing tricks worked and we both ended up frustrated and in tears. He went skipping into school as I was still fuming over how poorly I felt I handled the situation and how angry I’d let myself be with him. The week before, the three of us were quarantined due to a pink eye outbreak and it was almost my undoing. Being stuck at home with two little extroverts and no social outlet was exhausting and the house looked something like a tornado had touched down and destroyed everything but the walls of our house. I felt like after our week of quarantine, I was feeling overwhelmed and the morning of fighting left me feeling more than exhausted. Then I found out a friend’s husband passed away and I saw the pieces of me fall into a pile on the floor. Broken feels like a polite word. Hopeless feels more accurate. When life piles up and feels like it won’t get easier, I default to hopeless. When I’m overwhelmed, I have a hard time believing that something good could be just around the corner. I struggle to feel that I’ll ever be enough for my kids when I’m so prone to anger. I hate the feeling like I’m just treading water and not really living. I always want to be moving forward, achieving, and growing into a new, better version of myself. These days and weeks of overwhelming struggle feel like failure. When so many hard things are piling up, I can’t see the good things. I want things to be only good for awhile. I want a season of easy. When another hard thing comes along, my hope for good and easy vanish and turn into discouragement. But I should know better than to hope for good and easy. I know that life will be good and hard. Life will be difficult and easy. The good is only wonderful because of the hard and the easy is only achievable because I’ve conquered the difficult. I still feel inadequate, struggle to choose hope, and often feel like life is more than I can handle. And then on days like today, I hear a song that got me through one of the hardest seasons of my life. When Keith was sick and just after he died, Matt Redman’s song ‘Never Once’ was on repeat in my brain and it became a mantra in my life. In my darkest days, I felt God’s presence so tangibly. 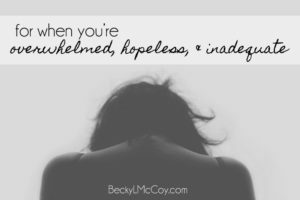 When I’m in a moment of hopelessness, I hold on to that and choose to hope that I’ll feel it again one day. 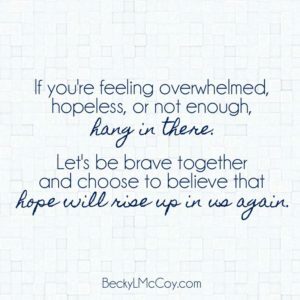 If you’re feeling overwhelmed, hopeless, or not enough, hang in there. Let’s be brave together and choose to believe that hope will rise up in us again. I needed to read this today! Thank you for being so vulnerable and sharing your heart to help others! Yes.. 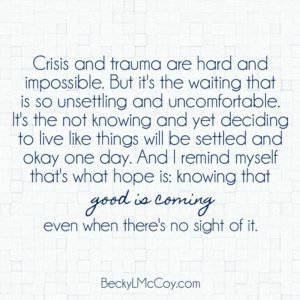 So much of this —>”When so many hard things are piling up, I can’t see the good things. I want things to be only good for awhile. I want a season of easy. ” thank you for sharing your heart. When things get hard I also find myself feeling hopeless. It’s hard to see the distinctions of grey tones in life when black and white make so much more sense. It seems though, there is always a light to come after the dark, even if it’s hard to wait on it and you don’t know when it will come. As far as the getting out the door for school stuff goes, I’ve been reading “Raising your spirited child” by Mary Sheedy Kurcinka, and it has been really eye-opening for me regarding personality types and kids’ needs. It’s changing my approach to parenting, and I think it’s applicable to most parenting relationships, with spirited or typical kids. Just keep chugging along. When you feel hopeless, remember you ARE already doing it, just keep moving forward. You are inspiring. 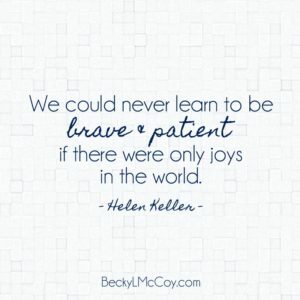 I continue to love reading your posts, Becky and plucking out bits & pieces of your posts–wanting a season of easy – but you help to make it more real and understandable and “do-able” even when some stuff just doesn’t make any sense. Keep writing, Becky, keep sharing. Love you.